Softness, mysteriousness and sexiness in this amazing photo shoot titled Sortilège (Sorcery). Some of the most famous fashion brands come here together - Roberto Cavalli, Dolce & Gabbana, Giorgio Armani, Bottega Veneta, Christian Louboutin, Lanvin, Chanel, Blumarine, Gucci, Fendi, Karl Lagerfeld... 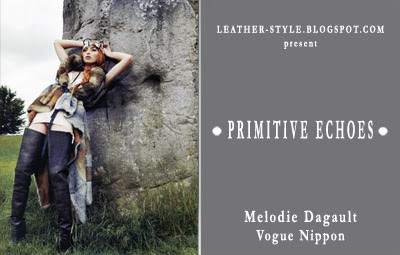 Starring Hungarian top model Eniko Mihalik dressed in furs, printed fur, leather and vinyl. The great shots are the work of photographer Miguel Reveriego. 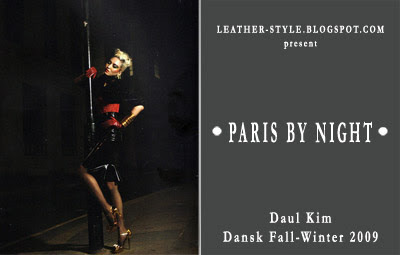 An memorable editorial published in August 2010 at the pages of the fashion magazine Numero France, issue 115. Polish top model Zuzanna Bijoch in black leather dress, gloves, boots, colored leather skirts and high platforms photographed by Sharif Hamza for Vogue Japan, issue September 2012. Editorial styled by fashion editor Giovanna Battaglia is called Hard At Work. Romanian top model Catrinel Menghia dressed in black leather pants play photographer in a short scene for Italian broadcast Chiambretti Show. Catrinel Menghia (also known as Catrinel Marlon) popular as the face of Giorgio Armani and lingerie model go madness guest and the Mediaset TV studio's audience with its amazing performance in skinny leather pants and a camera in hand. Selected from Ralph Lauren - Blue "Leather" Label: classic trench coat, T-shirt with short sleeves and hot pants - all of lambskin. A sensual combination in the natural colour of the leather. How look Paris by night? Parisians probably know best. For everyone else remains an provocative idea of Jean Luc Francaise, shot by photographer James Mountford. Starring asian model Daul Kim dressed in smooth and shiny latex, leather and vinyl outfit against a dark background [that could be located in any European city at night]. The designers Ashley & Mary-Kate Olsen founded a fashion brand The Row in 2006. Since then, twin sisters Olsen create stylish clothes in the best traditions of haute couture. 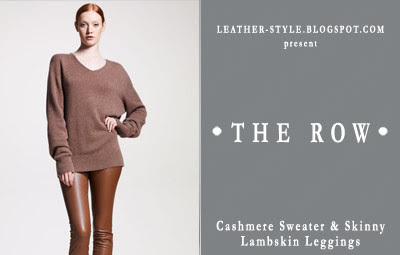 In their Fall-Winter 2012 Collection Ashley & Mary-Kate Olsen stake on pastel tones, clean lines and natural materials - wool, leather, cashmere. Classic elegance, sensual, sophisticated and... chic. 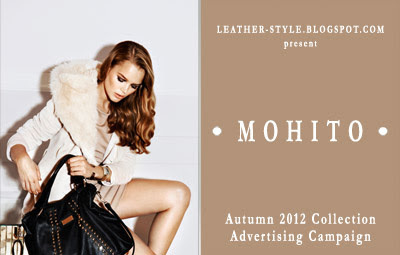 That is MOHITO Autumn-Winter 2012/2013 Collection. Polish models Olivka Chrobot, Svetlana Zakharova and Zosia Nowak in leather & leatherette photographed by Mateusz Stankiewicz for MOHITO Ad Campaign. 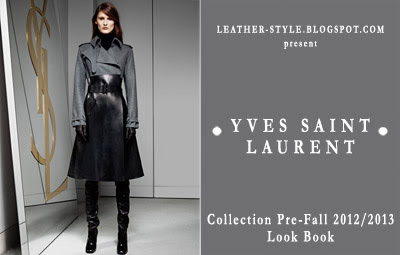 Opera leather gloves, over-the-knee / thigh high boots, leather pants, skirts and dreses... 10 HD photos of the Yves Saint Laurent Pre-Fall 2012 / 2013 Collection Lookbook. Sunshine, beach, sand and beuty model Ana Claudia Michels in wonderful leather apparel. The photographer is Craig McDean, the magazine is Harper's Bazaar, the year is 2000 or... not exactly... Editorial entitled "The High 80s". 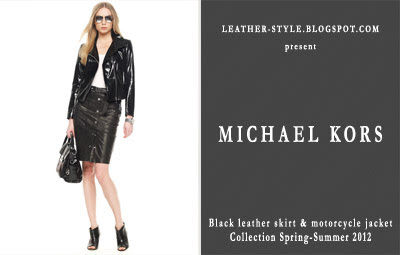 Black vintage leather skirt and snakeskin-embossed motorcycle jacket of patent leather with long sleeves and high waist by Michael Kors Spring-Summer 2012 Collection. Dynamics and elegance look about woman who knows what she wants. Brazilian top model Caroline Trentini in high platforms and colored latex stockings photographed by Fabio Bartelt for Caderno Ela, issue May 2010. Melodie Dagault in fur coats and over-the-knee leather boots photographed by Emma Summerton for Vogue Nippon editorial "Primitive Echoes".